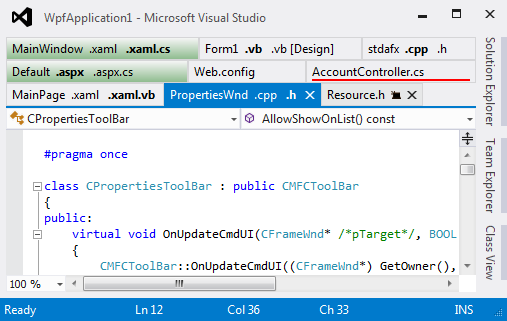 As a Microsoft Visual Studio user, you certainly appreciate the power and flexibility of this popular IDE, but what you DON'T appreciate is the massive amount of clutter that results when you have lots of open files ("lots" meaning more than, say, 8). It bogs your workflow down when you have to hunt for the right content in the middle of a burst of productivity! That's why you need Tabs Studio! 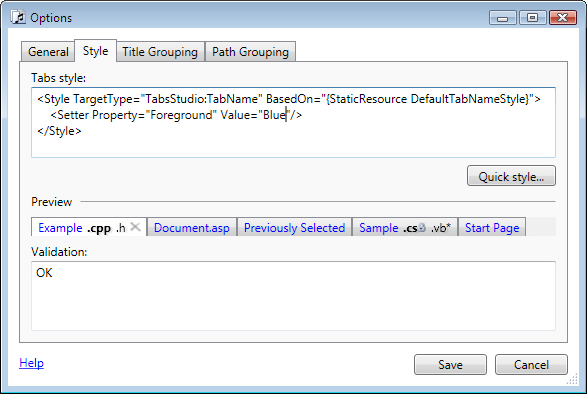 Tabs Studio is the best way to organize and customize Microsoft Visual Studio tabs, making all document tabs visible as multiple rows and grouping relevant tabs together. And if you have a widescreen monitor you can set tabs on a side in a vertical row! In fact, you can use Tabs Studio to gain complete control over all aspects of tab presentation, with custom add-ins that extend the flexibility to unheard-of levels of awesomeness! There's an impressive list of good things that you get when you install Tabs Studio! 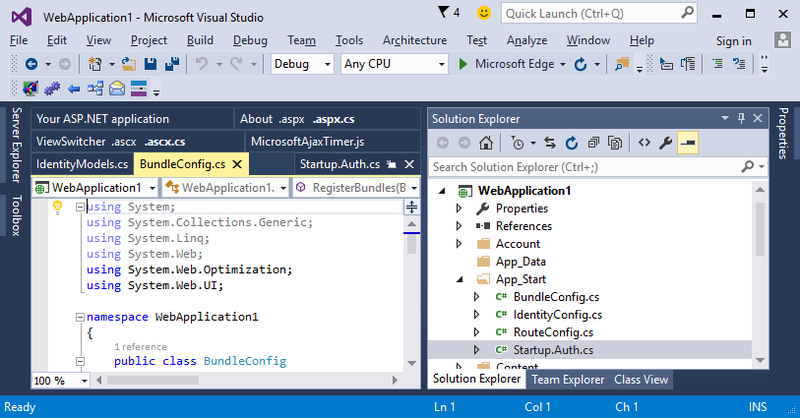 There's support for multiple IDEs, including the latest Visual Studio 2017 and SQL Server Management Studio 17. 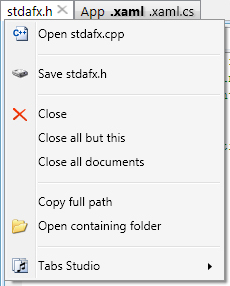 The ability to remove paths from tab names. You can even color your tabs and customize their shape for easy visibility! So get cracking on a more productive approach to working with Microsoft Visual Studio today - with your very own copy of Tabs Studio! 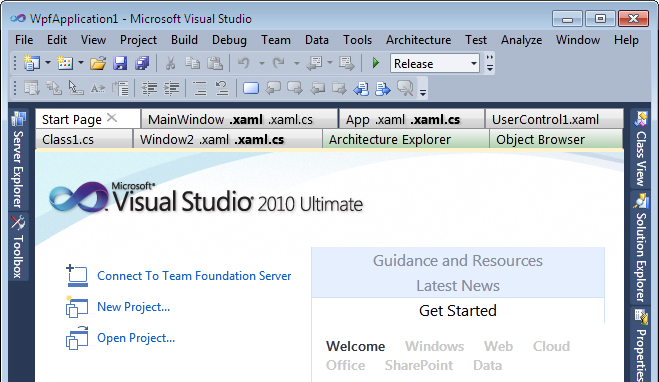 Organize and manage multiple open file tabs in Microsoft Visual Studio. Gain an increase in productivity and efficiency when you program. 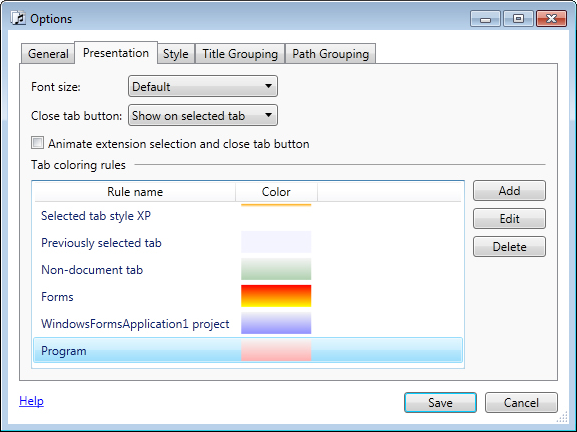 Exercise complete control over all aspects of tab presentation, including colors and shapes. Extend the flexibility of the program with custom add-ins. See all of your open files as horizontal or vertical tabs. After you purchase Tabs Studio it may be used indefinitely. Tabs Studio is licensed per user, so if more people are going to use Tabs Studio you will need to purchase additional copies. Each license allows installation on all owned computers, but Tabs Studio may not be used at exactly the same time on each of them.